1:54 a.m. Steamboat Springs Police Department officers were called about a man standing in the middle of the road, trying to hitchhike at Lincoln Avenue and Shield Drive. When officers offered him a courtesy ride, he became belligerent and refused. 9:23 a.m. Routt County Sheriff’s Office deputies were called about a reported threat in the 400 block of Willow Bend in Oak Creek. 12:10 p.m. Officers were called about a disturbance at a business in the 1000 block of Central Park Drive. A security guard there said a mother had reportedly kicked her child. After checking the security footage, officers determined the child was actually hanging on the mother’s foot as she was walking around. 1:37 p.m. Deputies arrested a man on suspicion of driving under the influence. 1:55 p.m. A caller notified officers about new graffiti spray painted on a tunnel along the Yampa River Core Trail near Howelsen Hill. 2:04 p.m. A man called officers after he noticed his credit card had been charged $1,600 at a local business. His primary suspects are a cleaning crew he recently hired and his own son. 4:25 p.m. Steamboat Springs Fire Rescue firefighters assisted someone who was bleeding in the 200 block of Park Avenue. 5:53 p.m. Officers were called about a woman accused of shoplifting $12 worth of makeup from a grocery store in the 1800 block of Central Park Drive. 10:23 p.m. Officers received a report of a stolen vehicle at 10th Street and Lincoln Avenue. The owners of the vehicle later realized they parked it at a different location. 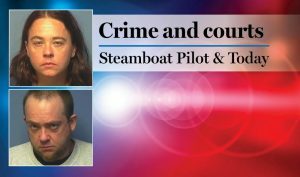 Routt County deputies had 18 cases that included calls for service and officer-initiated incidents such as traffic stops.